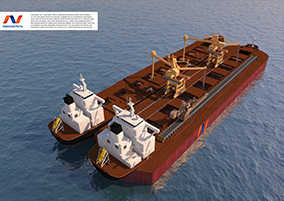 The Transmax™ is a large self-loading and unloading transhipment vessel for shallow draft ports. The majority of global import and export ports for bulk material are geographically remote and not sufficiently dredged to handle modern bulk carriers. Such bulk carriers with a deadweight of 180,000 tons usually require a draft of about 19 meters including clearance under the keel. Most ports have a draft of only 14 meters or even less. Dredging is very expensive and costs increase exponentially when dredging hard materials, furthermore environmental regulations/requirements are far reaching and challenging. 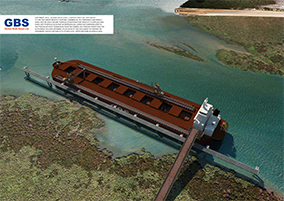 The self-propelled Transmax™ opens shallow draft ports worldwide to far greater tonnages with no dredging, capital expenditure, or change to materials handling process or equipment. The Transmax™ is a fast-efficient high volume transhipment solution; 185,000 DWT on 14 metres draft (each SSD-BC will be designed to match each port limitation). 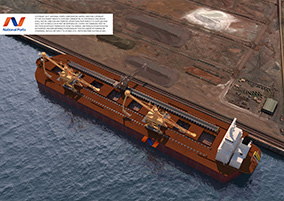 The Transmax™ is capable of self-unloading its cargo at a rate of up to 10,000 tons per hour into any size bulk carrier (including the Valemax with a 400,000 deadweight tons capacity) or directly at the destination port in a safe and environmentally friendly manner. 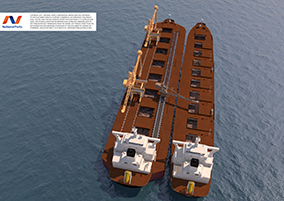 The Transmax™ can self-load from any ocean going vessel at the rate of up to 3,000 tons per hour or self-load directly from the land side via shore conveyors, thus limiting the capital expenditure for new port infrastructure. The Transmax™ can load from existing shore side ship-loader at the rate delivered by the terminal operator.